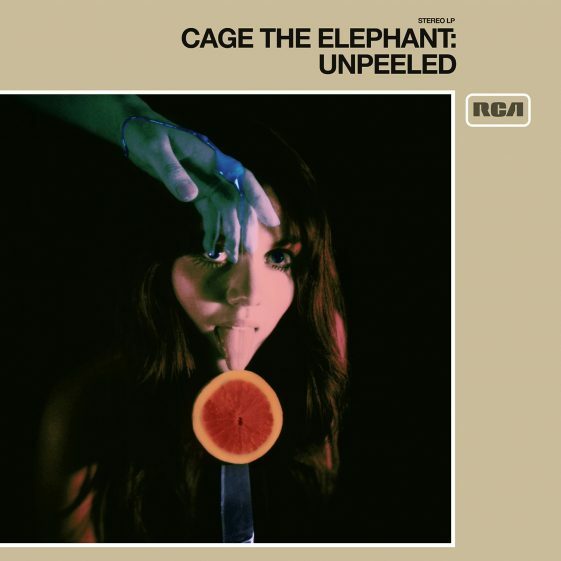 (New York – June 22, 2017) GRAMMY® Award winners, Cage The Elephant will release UNPEELED worldwide on July 28th via RCA Records. The new album was recorded over a series of intimate shows in cities including Los Angeles, Washington DC, Knoxville, and Nashville where the band performed in a stripped down arrangement with a string quartet and additional percussion. UNPEELED features twenty-one tracks: eighteen curated songs from their past four albums plus three reimagined versions of existing songs. Said front man Matt Shultz about the inspiration behind the album: “Many times you’re adding sonic layers looking for something to hide behind, and what you don’t realize is that that vulnerability and that nakedness might be the most compelling and interesting thing about the song.” Preorder the album here. Today, Cage The Elephant premiere their music video for “Whole Wide World,” featured on UNPEELED on Consequence Of Sound. The song, originally written and performed by Wreckless Eric, was re-imagined and recorded by the band at their sold-out, hometown show at the Ryman Auditorium and you can watch the live video here. Recently, Cage The Elephant appeared on Late Night With Seth Meyers to perform the UNPEELED versions of “Whole Wide World” and “Too Late to Say Goodbye”. Cage The Elephant are currently touring throughout Europe and have confirmed dates at some of the continent’s largest festivals, including France’s Main Square Festival, Spain’s Mad Cool Festival, and Switzerland’s Openair St. Gallen. The band will also perform a special show at Union Chapel where UK fans will experience the new versions of their songs as they will appear on UNPEELED, with a string quartet and in a stripped back arrangement. In addition, Cage The Elephant will be state-side starting in July and will play US festivals including Forecastle Festival, Lollapalooza, and Osheaga Music & Arts. Tickets for these dates are on-sale now available here. Cage The Elephant received their first GRAMMY® AWARD for Best Rock Album for their fourth studio album, Tell Me I’m Pretty, which was produced by Dan Auerbach of The Black Keys. At radio, Cage The Elephant holds the record for the most #1 Alternative songs of any artist this decade. Tell Me I’m Pretty’s first two singles “Mess Around” and “Trouble,” both topped the Alternative charts at #1 (“Mess Around” also hit #1 at Triple A). In addition, Trouble maintained its bullet on the Alternative radio chart for an astounding 41 weeks. “Cold Cold Cold,” went top 5 at both Alternative and Triple A. Watch the video for “Cold Cold Cold” and “Trouble,” both directed by singer Matt Shultz. Cage The Elephant consists of singer Matt Shultz, guitarist Brad Shultz, drummer Jared Champion, bassist Daniel Tichenor, lead guitarist Nick Bockrath and Matthan Minster on keyboard and backing vocals. Long celebrated as one of the most explosive live bands in the world, Cage The Elephant have sold out several headlining runs including a summer 2016 arena tour and recent sold out UK and European tour. Additionally, Cage The Elephant’s self-titled debut album was recently certified RIAA platinum.